Hirugami Hot Spring is well situated in the center of Japan being one and a half hours from Nagoya and about three hours from Tokyo. It is an essential stop-off for sightseeing the Kiso Nakasendo (Central mountain route), Mt. Fuji, Tateyama Kurobe Alpine Route, Hida Takayama, or Kamikochi and those trekking in the Japan Alps. Hirugami Hot Springs is a popular onsen area where you can experience how Japan was in times gone past. It is surrounded by the 3000-meter summits of the Central and Southern Japan Alps from where clear streams flow down. Some guests choose to spend their time relaxing within the Hot Spring area while others immerse themselves in walking, trekking, or photography. The spring waters of Hirugami are famed for their beautifying effect on skin. When rubbed on your body the high alkaline content waters make your skin feel smoother. Used as a face lotion, the spring waters have a moisturizing effect with heat-retaining properties being especially popular amongst our female customers. In a government study, Achi village has been recognized as the best place in Japan where stars can be viewed sparkling vividly. People come from throughout Japan to be charmed by the brightly lit sky viewed from this nature-filled valley. During the event season from spring to autumn, a nighttime gondola lift runs up to a star-filled garden at 1400 meters. And of course you can unhurriedly look up at the starlit sky throughout the year! 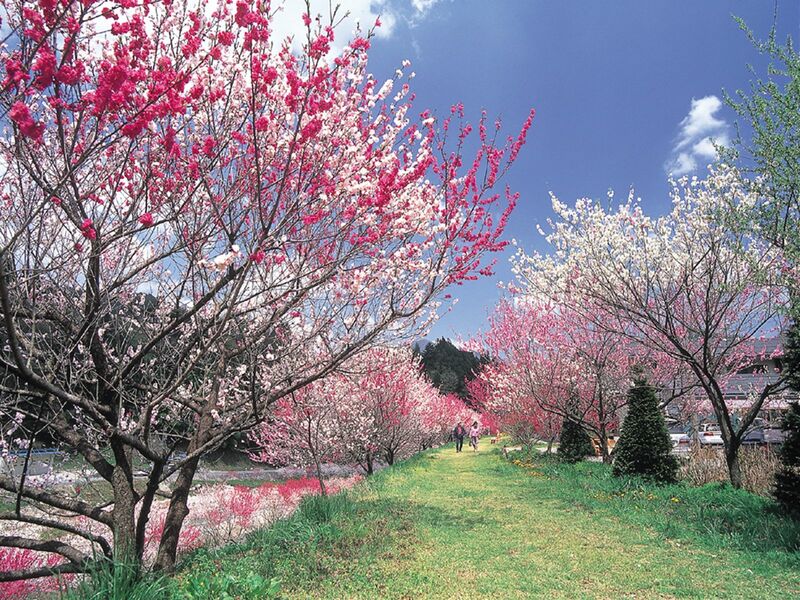 There are about 60 cherry blossom trees, many over three hundred years old, to enjoy in spring. Delicate petals bloom from these carefully pruned trees. You can also see about 5,000 trees of rare Hanamomo (peach blossom), each blooming flowers in vivid red, white, and pink, in our hot spring area and elsewhere in Achi village. Many tourists visits and look forward to this time. We are proud our mountains green in summer, leaves changing color in fall, and the snowy landscape of winter. Please enjoy fall foliage in the mountains during fall and in winter playing in the snow or skiing. Other than hiking and mountain climbing options, boat rides and golf courses are within a thirty-minute drive which we can recommend to guests who like the outdoors. You can also enjoy fresh fruit picking year-round from the choice of nearby apple, grape, strawberry, and cherry plantations.